Wimborne War on Waste, Saving the World, one Coffee Cup at a Time. Wimborne was buzzing on Saturday 22nd July 2017, however it wasn’t the caffeine from the coffee that was providing the kick but the excitement around what you do with the disposable cups that it’s served in. Reclaimed coffee cups formed arrows at the entrance to the Allendale Centre showing the way to the Coffee Cup Awareness event hosted by the newly formed group Wimborne War on Waste. The hall was adorned with coffee cup bunting, and an amazing array of hats and fascinators worn by both the organisers and event participants which had been made with old coffee cups and recycled odds and ends from the Dorset Scrapstore. The mood was exuberant helped along with music from The Midnight Voids, The Wimborne Ukulele Band and Just Sing choir. However the message was clear – we need to reduce the amount of rubbish and single-use plastic we generate – especially disposable coffee cups and those little pesky lids. Each minute 5,000 single-use cups are thrown away in the UK. The event, supported by the Wimborne Minster BID and Litter Free Dorset, was the brainchild of organisers Sarah Wise and Jo Skipp. After many weeks of planning and meetings with an equally committed and passionate group of local residents they began their mission to convert Wimborne into the first town in the UK to become disposable coffee cup free. Jo’s desire to be involved began with her fury at the amount of waste and recycling we produce. There are over 2.5 billion cups used every year in the UK and most of these are lined with plastic that can’t be recycled. Charlie from Litter Free Dorset was delighted to be part of such a positive event and glad to be able to show that there are other ‘doable’ alternative options available, such as biodegradable cups, reusable glass or plastic cups, bamboo fibre cups, and stainless steel cups. Wimborne War on Waste would like to launch a reusable coffee cup deposit scheme (based on a similar one operating in Freiburg, Germany), which is designed to reduce and ultimately remove coffee cup waste. They have already had great support from two of the town’s café’s The Thirsty Bird and Cloisters who have both shunned non-recyclable cups. Their first event had such a positive vibe and was extremely well attended, supported by local MP Michael Tomlinson, Jason Jones from Dorset Waste Partnership, and welcomed by the Mayor of Wimborne, Cllr Terry Wheeler who is proud that Wimborne has a great history of people doing great things in their community. 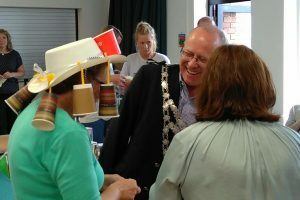 Mayor of Wimborne Cllr Terry Wheeler enjoys the coffee cup hats. 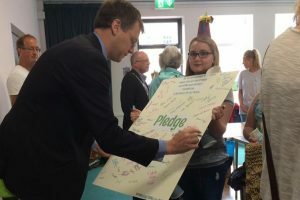 Michael Tomlinson, MP for Mid Dorset and North Poole signs the pledge to reduce use of single use coffee cups. Reduce your disposable coffee cup use; choose to drink-in from a ceramic cup. Refuse a plastic lid if you have to carry out. Recycle the lid at home if you have to have one. Request your café to provide you with a compostable or reusable cup. Disposable coffee cups may just be the start of the War on Waste in Wimborne, Sarah Wise has been so pleased with the amount of support they have had in the run up to this event that there is a plan to continue with their mission next to tackle plastic straws, plastic bags and plastic single-use drinks bottles. Do get in touch with Wimborne War on Waste if you would like to be involved in the Wimborne campaign, read more about reducing your plastic usage here, and remember to talk to your local café or workplace about alternative options.